Want to find coloring pages for our songs? Videos of animals or dances to go with the songs? Historical facts behind the activities? A digital download of the music? 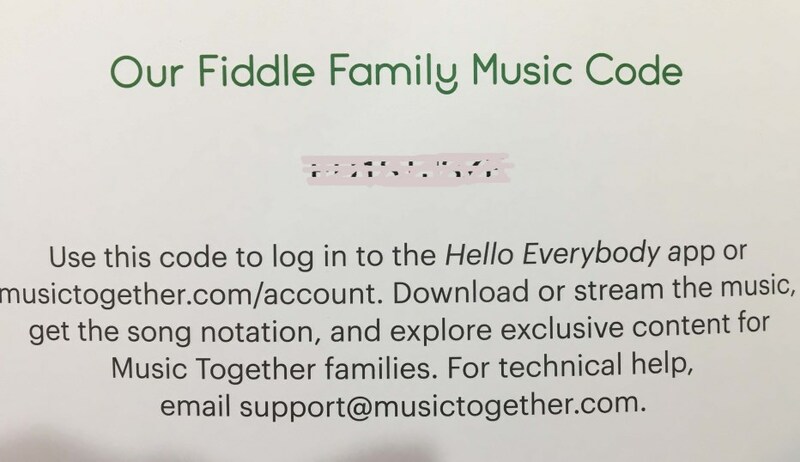 Enrolled families may order an extra CD via a form on the Family Music Zone, by emailing storeorders@musictogether.com, or by calling Alice at (800) 728-2692 x345. Parents will pay $2.95 US/$4.95 International for shipping and handling. New Features on the Hello Everybody App! Two new app features were recently released for users of iOS (Apple) devices. The updates will be made for Android devices in the coming weeks. Playlists: You can now make your own playlists in the app, combining their favorite Music Together songs from all unlocked collections, or groups of songs by theme. A big plus for teachers: Playlists automatically download to the user's device. Let's Play: The Let's Play section of the Family Music Zone is now available on the iOS (Apple devices) version of the app, beginning with the Fiddle 2018 song collection. When logged in, enrolled families will see the activities from the FMZ right in the Hello Everybody app. If you or a teacher hasn't set up your account and you are feeling a bit tech-challenged, or someone in your class needs help, feel free to share this short video that shows how to create your account and access your music via the Hello Everybody app. Using Playlists in the Hello Everybody App from Music Together on Vimeo.